Atlantic View in Cleggan, Co Galway sleeps 6 people. 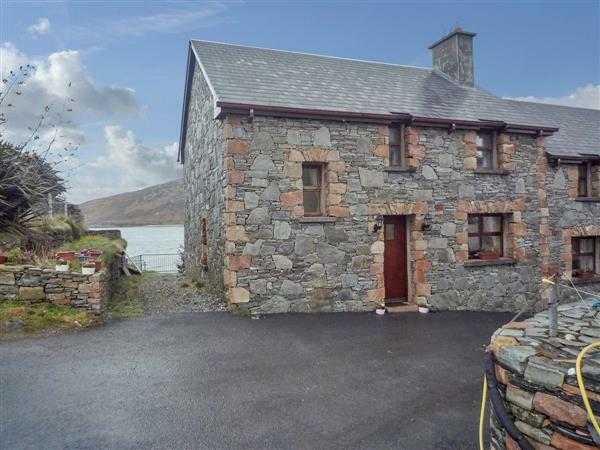 Set at the edge of a working harbour, in the beautiful fishing village of Cleggan, these two delightful properties command magnificent views of Inishboffin Island. Each features French windows, leading out from the well-presented open-plan accommodation onto a furnished terrace, in which to sit and observe the ever-changing vista. Built and furnished to a high standard, they are close to a range of amenities; shops, restaurants and pubs playing traditional music, as well as outdoor activities including tennis, horse riding, sea angling, golf and boat trips. Sandy beaches, pretty villages, Kylemore Abbey and the wilds of Connemara National Park all beckon exploration, with the Oceans Alive Sealife Centre close by for families, and the attractive town of Clifden 7 miles, for a further array of facilities. And after all that fresh air, what better way to relax than in a steamy sauna followed by a Guiness or two down the local inn. Ground floor: Living/dining room with wooden floor and French door/kitchen with breakfast area. Bathroom with sauna and toilet. First floor: 3 double bedrooms, 1 with en-suite shower room and toilet. Separate toilet. DVD Holidays at Atlantic View run from Saturday to Saturday. Do you want to holiday near Atlantic View (YEX), you can see other cottages within 25 miles of Atlantic View; have a look to find your perfect holiday location.